The site for the Steele Lane Medical Building is a long narrow wedge with streets on three sides and a freeway off ramp on the fourth. Problematic at best, this site sat vacant for many years. TFA designed a two story office building placed at the wide portion of the wedge with parking abutting the off ramp. 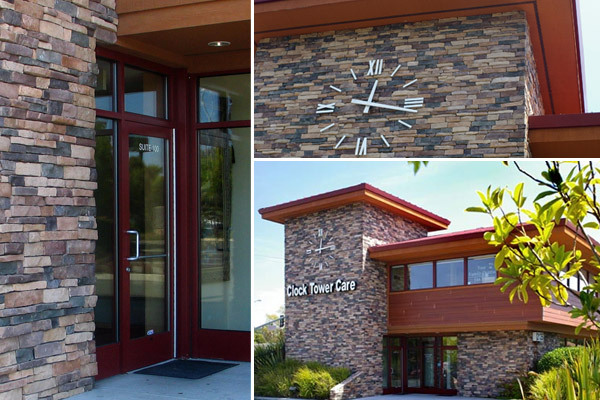 The owner desired a stone clad tower to create a visual identity for the building and this was incorporated into the westerly façade facing both the freeway and most highly trafficked street. The building itself has a standing seam metal roof and horizontal board siding on a stone clad base. The second floor is shifted south and west of the first floor; this creates sun and rain protection at those facades and results in a second floor set back from the street at the north and east facades. An elevator allows both floors to function for medical and other health profession tenants.